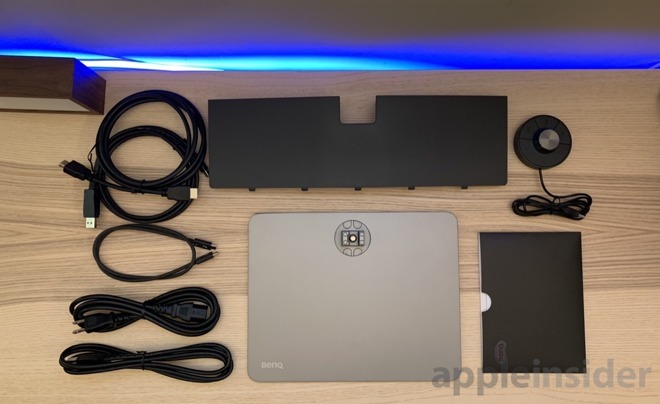 A few things jumped out at us when we initially laid eyes on the BenQ 32-inch 4K Thunderbolt 3 display. First, it supports HDR10 and the P3 wide color gamut so we knew colors were going to pop. Second, it supports Thunderbolt 3 with the ability to daisy chain. 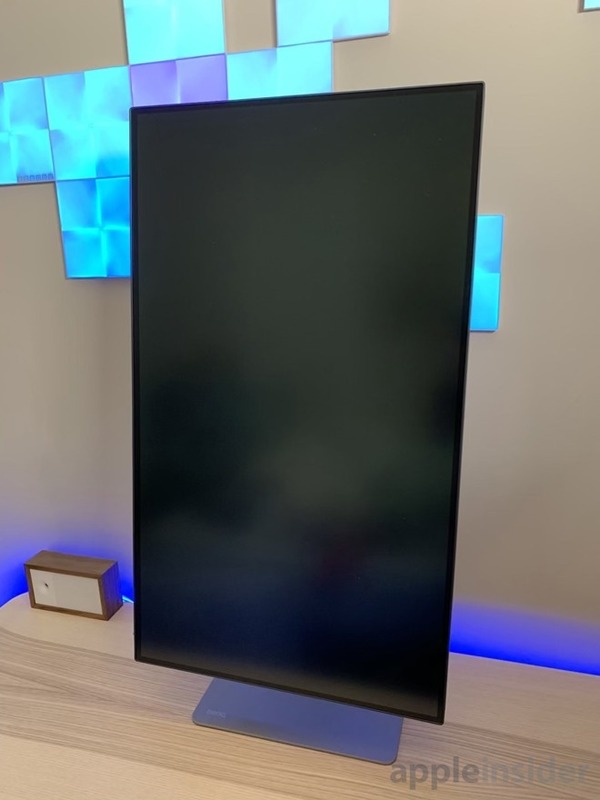 That was easily enough for us to ask to borrow one to try it out, not even including alone the 4K resolution, vertical orientation option, and the rest of the impressive feature set. The monitor showed up in a few different pieces, not much different than any other monitor we've taken a look at in the past. Many cables were included, but we were impressed that the DisplayPort cable was a DisplayPort to Mini DisplayPort cable. This adds immediate compatibility with previous generations of Macs with no adapters needed. Once assembled, we started to check out the bevy of ports. There are several along the back of the monitor and a trio down the left side. It just took a few moments to run through the assembly and get the monitor up and running with our 15-inch MacBook Pro. 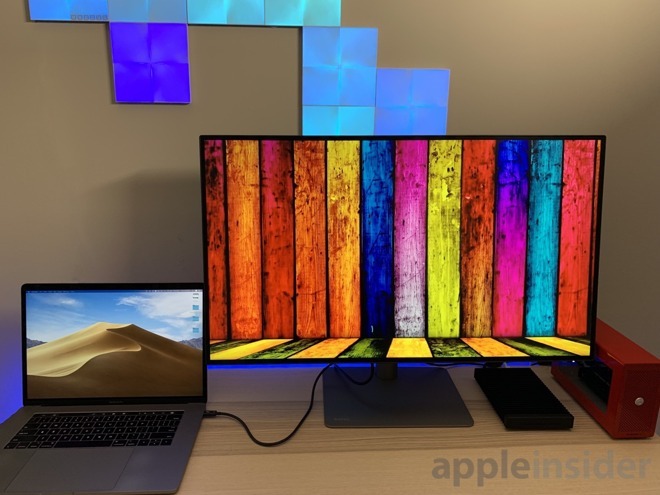 To connect your Mac you've got HDMI, DisplayPort, or Thunderbolt 3 as options with the last the preferable option. If you choose HDMI or DisplayPort, there is a USB Type-B port on the back of the monitor so that you are able to use the monitor as a hub. Thunderbolt 3 natively handles that, so you don't need the additional cable if you go that route. 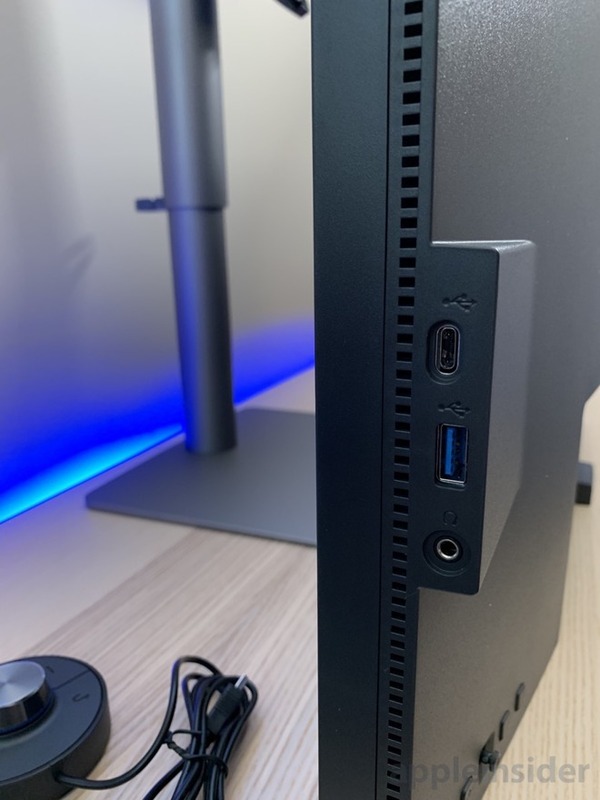 You also can access a USB type-C port, a USB-A port, and a headphone jack on the left side of the monitor. 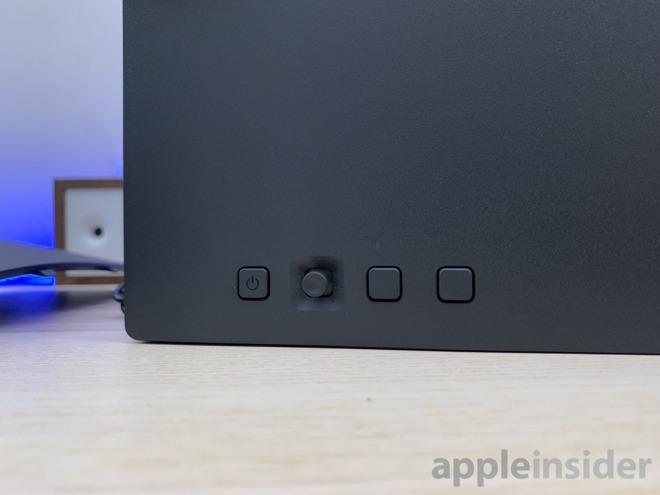 That USB-C port is a differentiating factor from some other monitors in the class, and helps ensure that this monitor retains its usefulness into the future as we transition more towards the new connector type. For controls, there are three buttons and joystick located behind the monitor on the bottom right side. Your hand can go under the monitor and easily access all of these without rotating it. The power button, located to the far right, is the only button by itself and with an icon on it so it is easily identifiable. We haven't explored the menu system in-depth yet, so you will have to hold off for the full review to see how intuitive it is. After we booted up the monitor, we thought it looked great for the brief time we have initially used it. Colors are gorgeous and vivid and text is crisp. We will have to explore what resolutions we prefer as we work on the full review. This monitor has a standard 4K 3840x2160 resolution, covers 100-percent of the sRGB gamut and 93-percent of the P3 color space. It, like the LG UltraWide we recently reviewed, supports HDR10 as well. One of the Thunderbolt 3 ports, labeled with the computer icon, provides 85W of power, and the other provides device power of 15W. The lower power is still suitable for a bus-powered SSD or similar, but users should check power requirements of attached devices to be sure. A unique feature to BenQ monitors is the Hotkey Puck G2. This accessory connects to the monitor over micro USB and lets you change several settings such as color mode, brightness, contrast, and more. If you use a lot of vertically oriented apps —such as development tools or PDFs —you may be interested to use the vertical orientation. The monitor rotates 90-degrees to act as a portrait format monitor which has several use cases. Few monitors support this, so if this is a must-have feature for you, this may be the perfect solution between great visuals and that necessary orientation. We're initially impressed, but time will tell the tale about how we ultimately feel about this particular display. AppleInsider will be taking a closer look at this monitor in a full review in the coming weeks. 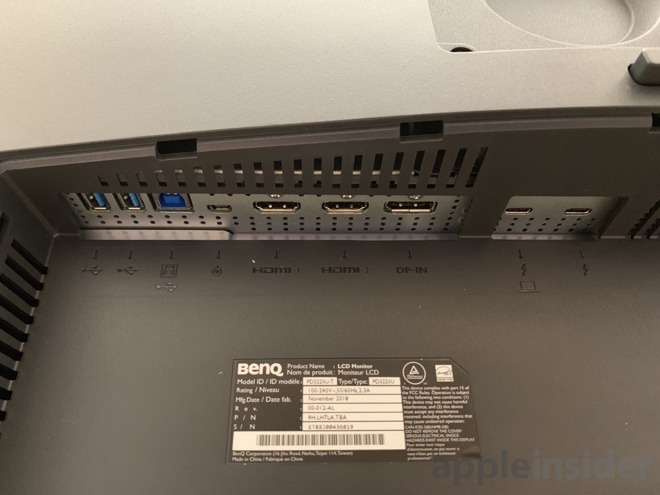 The BenQ PD3220U 31.5-inch display can be purchased for $1,199.99 at BenQ authorized dealer B&H Photo with free expedited shipping within the contiguous U.S. Units are currently on backorder at B&H with availability expected in 7 to 14 days, which is significantly less than Amazon's current 1 to 3 month wait.